Bryan's Guide to Russian History – A exploration of Russian History. A exploration of Russian History. Chernobyl is the worlds largest nuclear accident. It occurred on April 26, 1986. It started when the plants #4 reactor exploded violently. Many people were killed because of the harmful radiation that was emitted, and large swaths of land around the town were deemed unsafe to live in. However, there were other consequences, both good and bad, besides the immediate loss of life. One major effect, was the uprooting of hundreds of thousands of people essentially overnight. Because the harmful radioactive dust was spreading and contaminating the land people were forced to leave immediately. Roughly 116,000 people were relocated from a 30km zone around the site. New steps to alleviate the impact of Chernobyl have been put into place, and it is hoped by 2020 people can begin to return with minimal restrictions. This Picture shows the modern day vs. 1986 exclusion zones. A second consequence was it strengthened Gorbachev’s resolve to reverse the nuclear arms race. (Freeze 457) He stated that; “We learned what nuclear war can be”. (Freeze 457) This event combined with others greatly aided the reduction of the nuclear arms race. The Soviets went from nuclear parity, to nuclear sufficiency. After realizing what nuclear war could be like, Gorbachev’s foreign policy greatly changed. He told his people that they could not be drawn into prolonged arms races, that they may not win. ——- This documnt is the “Proposal on the Expiration of the Unilateral Soviet Moratorium on Nuclear Testing”. It shows that while the Soviets would continue testing, they were willing to step to the table for talks with the US. Another consequence was that the policy of glasnost was fully put to the test. Until this moment it had been merely a slogan of the government. Now it became practice. This term refers to a policy of a more open government, and of the sharing of information. While to Soviet Government was slow to respond globally at first, once they did they allowed for medias from many nations to cover it. Uncharacteristically, the Soviet Union also welcomed outside help from other nations in aiding those who had been displace, as well as exploring the consequences. While these are just some of the consequences of this disaster there are many others. The economic ramifications were enormous, as well as the attitude in the Ukraine towards Russia. It fueled resentment and spurned old memories of Soviet Repression. The only positive outcomes were glasnost being implemented successfully and Gorbachev’s continued stress on nuclear reduction. NationalGeographic. “30 Years After Chernobyl, Nature Is Thriving | National Geographic.” YouTube, YouTube, 20 Apr. 2016, http://www.youtube.com/watch?v=E-h15wX14po. “Amateur Radio in the Chernobyl Exclusion Zone.” PA7MDJ Amateur Radio Blog, pa7mdj.blogspot.com/2016/09/amateur-radio-in-chernobyl-exclusion.html. “Chernobyl Accident 1986.” Chernobyl | Chernobyl Accident | Chernobyl Disaster – World Nuclear Association, World Nuclear Association , http://www.world-nuclear.org/information-library/safety-and-security/safety-of-plants/chernobyl-accident.aspx. “Chernobyl Exclusion Zone.” Radioactivity : Chernobyl Exclusion Zone, http://www.radioactivity.eu.com/site/pages/Chernobyl_Exclusion_Zone.htm. 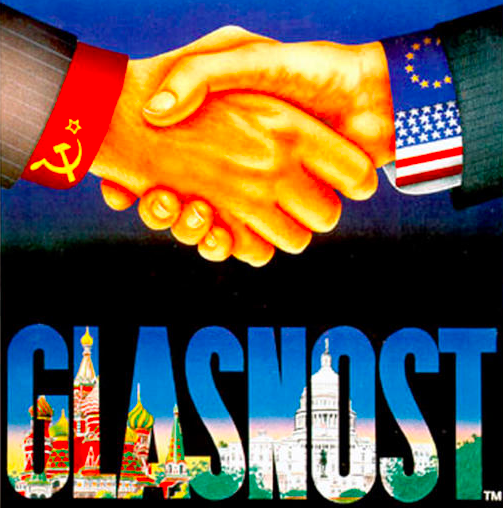 “Glasnost & Perestroika – The Cold War In Depth.” Google Sites, sites.google.com/site/coldwarindepth/home/end-of-the-cold-war/glasnost–perestroika. “Meltdown in Chernobyl.” Seventeen Moments in Soviet History, 2 Sept. 2015, soviethistory.msu.edu/1985-2/meltdown-in-chernobyl/. “The Cold War Museum.” Cold War Museum, http://www.coldwar.org/articles/80s/glasnostandperestroika.asp. Wilson Center Digital Archive. Wilson Center Digital Archive, digitalarchive.wilsoncenter.org/document/115456. In 2016 there were roughly 4,256 satellites orbiting Earth. Before 1957 there were none. That all changed with the launch of Sputnik I from Russia on October 4, 1957. Sputnik I was roughly the size of a beach ball and could orbit Earth in around 98 minutes. This was the first major victory in the “Space Race” between the United States and the Russians. In december of 1957 the US also tried to launch an Earth orbiting satellite. The launch of the Vanguard satellite by the Americans however was unsuccessful. Then only 4 months later the Russians put another satellite into space. This time with a living creature. Laika the dog launched in the Sputnik II satellite was the first living creature in space. Tragically Laika died within hours of the launch. Laika in the capsule she would be in during her brief Space stay. After these first few launches the space race between the Soviets and Americans heated up drastically. Billions of dollars were funneled into the space programs of both countries. The Soviets won other major victories, such as Yuri Gagarin becoming the first man to orbit the earth, and with Luna 2 being the first space probe to hit the moon. The space race would continue until the US “won” by landing astronauts on the moon. During this time there was a feeling of great adventure, and thoughts of the endless possibilities of space travel. As can be seen in an article from the Current Digest of the Russian Press from 1958, Leonid Ivanovich Sedov stats; “I think that you young people will witness the unveiling of the mysteries of Mars, to which flights will be made within the next 20 years, according to my assumptions”. (Sedov) This shows the thoughts and feelings of the academic community, as well as the people in general. Space was the new frontier and everyone wanted to explore it. History.com Staff. “The Space Race.” History.com, A&E Television Networks, 2010, http://www.history.com/topics/space-race. “Launch of Sputnik.” Seventeen Moments in Soviet History, 21 May 2017, soviethistory.msu.edu/1956-2/launch-of-sputnik/. “Sputnik Sticker from the Historic Robotic Spacecraft Series.” Chopshopstore, http://www.chopshopstore.com/products/sputnik-first-in-space-sticker. Turner, Josie F. “The Story of Laika: The First Dog in Space.” Animalwised.com, Animalwised.com, 16 Oct. 2017, http://www.animalwised.com/the-story-of-laika-the-first-dog-in-space-1756.html. Almost immediately after WWII in Europe concluded in Europe, the Cold War began. This refers to the time between 1947 and 1991. With victory of the Germans in Europe, the two remaining super powers were the United States and the Soviet Union. Though there are many major events throughout the Cold War I believe that there are several that in 1947, and the late 1940’s that set the precedent for the remainder of the Cold War. One such event was the institution of the Truman Doctrine, in March of 1947. The original plan called for 400$ million in aid for Greece and Turkey. The theory behind this was known as the domino effect. It was believed that if they fell to communism then it would spread throughout the rest of Europe like falling dominos. This naturally caused greater tension between the Soviet Union and the Western Democracies. They wanted to attempt to contain communism and keep it from spreading. However, Communism doctrine stated that it must continue to spread. Another plan by the United States that caused strike was the Marshall Plan. This plan called for billions of dollars to restore Europe, and give economic aid to any European country that accepted it. However, Stalin outright refused this. He also would not allow any Eastern European country participate, and if they requested to they were severely reprimanded. Stalin also ordered Italian and Spanish communists to attempt to somehow sabotage these attempts. And then in 1948, after a currency reform, Stalin started the Berlin Blockade, because he believed it was an attempt to establish capitalism in West Germany. This was an image used to promote the Marshall Plan in Europe. Another major event that also escalated the cold war was the formation of a unified West Germany in 1949. Britain, France, and the US. It was known as the Federal Republic of Germany. This of course angered Stalin who viewed this as an attempt to undermine him, and unify all of Germany under capitalism. After this event, Stalin essentially ceased all talks with the Western Democracies, and the Cold War really got started. While these were not the only beginning events in my opinion they are some of the most important that set the tone for the rest of the Cold War. They can be studied and possibly show how the Cold War itself could have been avoided. However, the two ideologies were so different, whether these events occurred of not the Cold War could have started another way. “Cold War.” Seventeen Moments in Soviet History, 30 Nov. 2015, soviethistory.msu.edu/1947-2/cold-war/. “Federal Republic of Germany Is Established.” History.com, A&E Television Networks, http://www.history.com/this-day-in-history/federal-republic-of-germany-is-established. History.com Staff. “Cold War History.” History.com, A&E Television Networks, 2009, http://www.history.com/topics/cold-war/cold-war-history. History.com Staff. “Joseph Stalin.” History.com, A&E Television Networks, 2009, http://www.history.com/topics/joseph-stalin. “Marshall Plan.” Wikipedia, Wikimedia Foundation, 28 Mar. 2018, en.wikipedia.org/wiki/Marshall_Plan#/media/File:Marshall_Plan_poster.JPG. “Start of the Cold War – The Truman Doctrine and the Marshall Plan.” Khan Academy, http://www.khanacademy.org/humanities/ap-us-history/period-8/apush-postwar-era/a/start-of-the-cold-war-part-2. “The Cold War Timeline.” History, 31 May 2017, http://www.historyonthenet.com/the-cold-war-timeline-2/. “Truman Doctrine (1947).” Our Documents – Truman Doctrine (1947), http://www.ourdocuments.gov/doc.php?flash=false&doc=81. Once the Bolsheviks were firmly in control and Stalin had established himself as the man in charge there came a great many changes to Russia during the 1920’s and 1930’s. One major problem Stalin had was the peasants. The majority of the peasants were not communist and often very distrustful of them and other outsiders. Another problem was the grain crisis of 1927. After overseeing the aggressive procurement of grain from the peasants earlier Stalin decided to collectivize them onto state farms. The Peasants did not approve of this plan. As Freeze states; “But collectivization and the resistance it provoked cost vastly more lives than the October Revolution or even the ensuing civil war.” (Freeze 348) The peasants did not want their right to own private land abolished and to be forced to move and leave all of their possessions. This image shows Kulaks being deported. One collectivization had been accomplished the conditions were horrible. In a letter to Ordzhonikidze who was a close friend of Stalin, Feigin states; ” I was in various kolkhozes–not productive and relatively unproductive ones, but everywhere there was only one sight– that of a huge shortage of seed, famine, and extreme emancipation of livestock”. (Feigin letter) Many of the peasants perished form these conditions. https://www.loc.gov/exhibits/archives/coll.html This line will take you to the Library of Congress with other translated documents about the conditions of the Kolkhozes (collective farms). 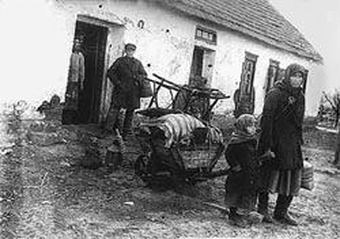 While this collectivization was able to help the Bolsheviks maintain power, and to ease some of the burdens of famine, we must not forget what the peasants went through. They were torn from their homes, forced to leave all their belongings, and transported to new areas. Most did not want to go, and were forces. Many resisted and died. So in the end, was it worth it? That question may forever remain unanswered. Russia A History: Gregory L. Freeze. In 1917 there were two very important revolutions in Russian History. The first one was in February and the second was in October. The February revolution started with bread riots by women then transformed into a full scale revolution that spread across the country. This led to the overthrow of the current autocracy, which was replaced by the Provisional Government. However, the Provisional Government was extremely unsuccessful, and ineffective. However, in my opinion the October revolution and the dissolution of the Constituent Assembly had a much greater impact immediately as well as long term. In October the Bolsheviks had finally gained enough power and support to march on the officer of the Provisional Government as well as the 2nd Congress of the Soviets. After this they had almost full control of the Government. After the takeover, Lenin still allowed the Constituent Assembly to be voted on. However, once the voting was done He realized that the various SR factions had received nearly half of the 42 million votes while, the Bolsheviks had only received around 10 million. The Constituent Assembly only met for one day, before Lenin removed it. This was another major event. It solidified the complete control of the Government by the Bolsheviks. The Bolsheviks taking power, and Lenin’s removal of the last form of democratic government are two major events in Russia’s history. They solidified Russia’s political and economic policies for most of the 1900’s. With the bolsheviks came socialism and communism. This would dictate economic polices, as well as internal and international policies. Without the October revolution we may even have not had the cold war. Russia could have become somewhat democratic and have had a completely different history. This is the Kompaund Steam Engine. This steam engine and the many others like it were instrumental in Soviet History. Before railroads and efficient steam engines much of Russia was completely rural, and not easily accessible. The introduction of such steam engines and the many miles of railroad allowed for people, and more importantly raw materials to be transported to all areas more easily. This was instrumental in bringing about Industrialization, which was key for Russia to become a dominant world power. This photo was taken in 1910. This was an important time period in Soviet society. Whisperings of revolutions and reforms were beginning, as well as unrest in the rest of Europe. Railroads and steam engines such as this one were crucial for Russia during WWI and the revolution that followed. Because of its large expanse almost every soldier was transported to the front by railway. Without the railways Russia would not have been able to get soldiers to where they needed to be. Railroads and Steam Engines were also instrumental in the Bolshevik Revolution during 1917. Both the red and white armies used railroads and engines extensively to transport their troops, as well as to spread their message. Since the Steam Engines could move much more efficiently than other modes of transportation they were instrumental in spreading the ideologies of both armies, as well as moving their troops throughout the interior of Russia.